The story of a young boy with Down Syndrome and his beloved pony has captured hearts and won an award, and is now on tour. 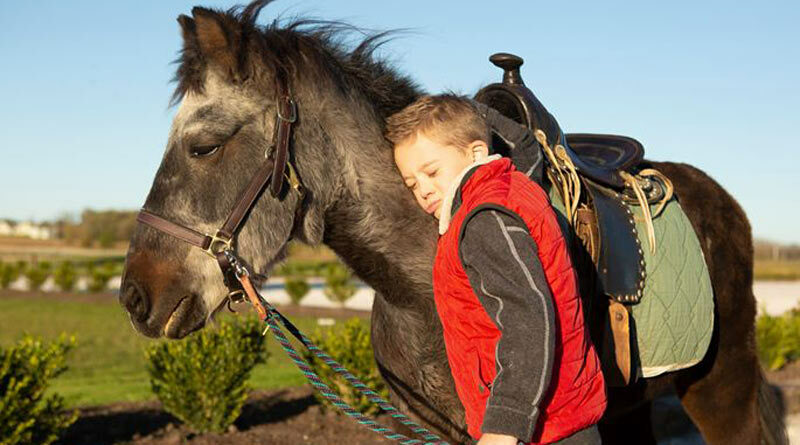 The Equus Film Festival documentary A Pony And His Boy: The Story of Berry and Josh, features eight-year-old Josh and his best friend Berry, who is 28, and shows the power of a pony and the effect that he has had on a small boy. Directed by Julianne Neal, the 23-minute documentary won a prestigious Winnie Award from the annual Equus Film Festival, and has been selected to screen at the National Downs Syndrome Convention in Pennsylvania in June. A Pony and His Boy is going out on the Equus Film Festival Tour Stop program around the US as well as on the Equus Film Festival On Demand Platform. As well as various dates and locations in the US up to May, the film will also be shown in Germany and Britain in the northern summer. Many people have found the wonderful power of horses to help break through the silence of autism and the fear of PTSD. A Pony And His Boy addresses Down Syndrome and the power of horses to help us connect. Berry, the pony star of the film, teaches us that even though a pony may be old it doesn’t mean he can’t find a new job and be loved. A Pony and His Boy will be shown at the National Down Syndrome Convention in the US later this year, which will host thousands of attendees. Josh had been afraid of animals, especially horses, all of his life. One summer afternoon, when walking in the pasture full of horses with his mom and Equus Film Festival director and founder Lisa Diersen, Josh was asked “Do you want to ride?” When he surprisingly said yes, they caught him off-guard, swept him up and placed him on Berry. The relationship that started between Berry and Josh that day has been life-changing, not only for Josh, but for everyone who loves him. Josh is now also riding his mother’s Lusitano mare. “They simply can’t keep him away from the horses now when they are at the barn,” Diersen said. Filmed in Illinois, North and South Carolina, plus featuring heartfelt testimonials and informative interviews, A Pony and His Boy is a testament to the power of the horse. The Equus Film Festival bring the issues facing horses today to the world through documentaries, highlighting some of the wonderful stories of horses helping people. A Pony and His Boy is part of the festival’s Spotlight Rescue Series, which director Julianne Neal helped to create. The film is showing at Arcadia Theater in Chicago on Wednesday night, and Josh will see himself on-screen for the first time. A portion of the proceeds from the screening will go to therapeutic riding group Hands & Hooves in Illinois. Josh will see his story on-screen for the first time this week. In every cell in the human body there is a nucleus, where genetic material is stored in genes. Genes carry the codes responsible for all our inherited traits and are grouped along rod-like structures called chromosomes. Typically, the nucleus of each cell contains 23 pairs of chromosomes, half of which are inherited from each parent. Down syndrome occurs when an individual has a full or partial extra copy of chromosome 21.